Actress and comedian Sally Phillips will open CRE 2018 (9.45am, Tuesday 16 October!) and encourage hundreds of churches to put people with additional needs at the top of their agenda. 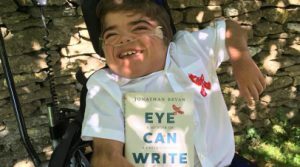 Sally, whose son Olly has Down’s Syndrome, will be joined by a 12-year-old best-selling author – Jonathan Bryan has quadriplegic cerebral palsy and is entirely non-verbal. At the opening ceremony, blind singer-songwriter Marilyn Baker will be accompanied by a choir from Notre Dame School, Cobham using Makaton, a language programme of signs and symbols to help people communicate. BC sitcom Miranda and the Bridget Jones films, as Bridget’s best friend, Shazza. As well as opening CRE, she will be interviewed by Rev Cindy Kent in Cindy’s Bar. Among the 200+ exhibitors in Churches for All. Exhibiting together on the CfA stand will be three CfA partners: The Lodge Trust, Torch Trust, and for the first time Count Everyone In. See you there! Use this link to get your free tickets now!